Pop culture and politics reign supreme in our April picks: Read the original versions of favorite supernatural TV shows, 11/22/63 and The Leftovers, learn more about the Founding Father without a father and the current front-runner in the Democratic primary, plus take a look at the “nice guys” in the dating pool. Dave: Stephen King is known for writing stories that blend the supernatural with everyday life. 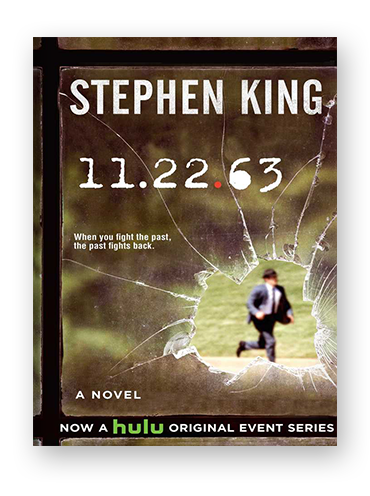 In 11/22/63, he does so by placing an unexplained time portal in the sleepy town of Libson Falls, Maine, where it is discovered by Jake Epping. Jake makes the decision to travel through the portal with the mission of preventing the assassination of John F. Kennedy. Of course, the portal only leads to September 9, 1958, which means Jake has to wait around for a few years before he is able to change history. In the novel, King purposefully disregards the mechanics of time travel by keeping the rules relatively simple. In doing so, he’s free to go after the bigger questions of life, love, free will, and personal responsibility. The result is one of the best time travel stories since H.G. Wells—not because of King’s sci-fi spectacle or the book’s historically significant plot, but because of the subtle, human story that is told against such a narratively rich backdrop. Kiri: This biography of Alexander Hamilton inspired the hottest musical currently running on Broadway. Ron Chernow, a Pulitzer Prize–winning biographer and journalist, traces how a Scotsman orphan born to a prostitute, grew up to be a hero and a scholar, one who became an aide to George Washington during the Revolutionary War and co-authored the majority of the Federalist papers, eventually serving as the first Treasury Secretary. Alexander Hamilton explores not just Hamilton’s economic and political genius (he doesn't get enough credit for all the credit he gave us), but captures the complexity of his character and life. Illustrating the full measure of the man with his sharp wit, charismatic nature, and literary skill, Chernow maps how young, scrappy, and hungry Hamilton rose far beyond the squalor into which he was born to become an integral part of the founding of the American political system. Alex: As anyone who’s spent enough time on the internet knows, guys who spend a lot of time talking about how “nice” they are tend, emphatically, not to be. Nate Piven is a self-described nice guy. He’s also a Harvard grad and a respected author in his early 30s, with increasing cachet within his Brooklyn intellectual-elite social circle. But as much as Nate can intellectualize his privilege and societal biases, he’s blind to the petulant attitude and often cruel behavior he exhibits towards the women he dates. Nate’s condescending and subtly misogynistic thoughts feel painfully realistic. The author, Adelle Waldman, has typified the kind of highly educated, liberal, purportedly feminist men who nonetheless find that they only read books by male authors, and all-too-easily dismiss emotions or arguments they perceive to be feminine. Nate’s entitled attitude and myopic self-absorption are frequently infuriating, and yet The Love Affairs of Nathanial P. doesn’t read as a hatchet job. It’s hard not to empathize—at times to agree—with Nate’s perspective on some of the histrionics he witnesses. Overall, this is a closely observed comedy of manners that perfectly names many of the hypocrisies and absurdities of modern life, and especially of modern dating. Ashley: “What if the Rapture—or a similar event—happened suddenly and unexpectedly?” This is Tom Perrotta’s supernatural jumping-off point in the story of a suburban New York family. In many ways, The Leftovers defies all the expectations set up from that premise—it’s not about religion, despite featuring two new religious cults that spring up in the Sudden Departure’s aftermath, and it’s not a mystery where various characters try to figure out why two percent of the population disappeared one day in the midst of their regular routines. Instead, it follows the Garveys, a nuclear family that, while they all survived the Sudden Departure, tears itself apart due to the loss of friends and the feeling that nothing—family, college, work, life itself—really matters anymore. Perrotta treats such deep emotional devastation with the gravitas it deserves while still serving up his signature humor. It’s the ultimate tale of survivor’s guilt, where everyone in the whole world is afflicted and finds bizarre yet familiar ways to help each other cope, and to try to preserve the leftover scraps of humanity.